Roland White was born in Kent, England, and began his musical career playing cornet in the Salvation Army. Later he switched to trombone and in 1946 he joined The Royal Marines Band Service where he studied under Lt. Col. Sir F. Vivian Dunn. He served twelve years in the Marines as a member of Her Majesty’s Royal Marines Staff Band, Portsmouth, the band that served aboard the Royal Yacht Brittania. 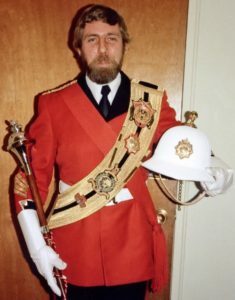 During his time with the Staff Band, Mr. White toured throughout the world and performed under the batons of such notable conductors as Sir Malcolm Sargent and Sir John Barbarolli. Following his military service, Mr. White emigrated with his family, first to Australia, and then in 1968 to Canada. 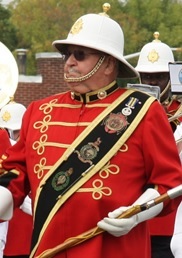 Living near Cobourg, Ontario, he accepted the position of Director of Music of the then struggling Cobourg Band in 1970 and began the task of rebuilding the band to the standard that it now displays. Mr. White retired in 2000 with the title Director of Music Emeritus, after 30 years of dedicated service. Keith joined the band in 1977. He was a high school music teacher for many years at Clarke High School in Orono, followed by CDCI East in Cobourg before retiring to British Columbia to be near his children and their families. Keith enjoyed playing French Horn in the Band when not conducting. Tom MacMillan served with the OPP until 1993. 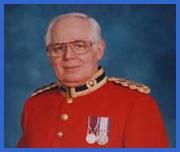 He was also well known as the Town Crier of the Town of Cobourg, from 1990-2013. Married for 51 years, he had 3 daughters, one of whom played bassoon with the Concert Band. When Roly White was looking for a replacement for retiring Drum Major Robert Irvine in 1980, Tom volunteered and led the Band in almost every parade and tattoo for the next 33 years. He served as Band Ambassador until his passing later that year. From his early beginnings as an 11-year old member of the Junior Cobourg Kiltie band in 1944, Bob has played clarinet with the Cobourg Kiltie Band, the Trinity Men’s Club Orchestra, the Cobourg Clown Band, Mary & Friends, and the Concert Band of Cobourg in addition to performing in many smaller trio and quartet groups. Within the Kiltie and Concert Bands, he served in many different executive positions including Librarian, Secretary-Treasurer, Director, President, and Drum Major. 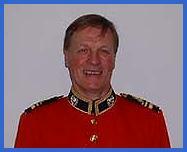 Bob played a key role in transitioning the band from the Kiltie era into the more recent Concert Band style. Along the way he helped with securing a long-term funding commitment from the Town of Cobourg and with creating the band’s permanent rehearsal facility on D’Arcy Street. Most recently, Bob has been the Band Historian, compiling his book Journal of a Band over 10 years of research.